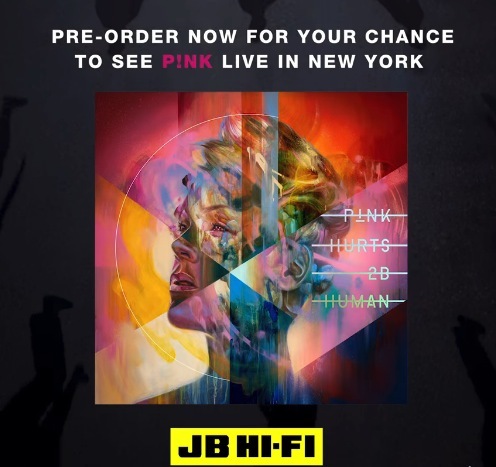 Enter the new JB Hi-Fi P!ink Competition for your chance to Win a trip to see P!nk perform live in New York City. To enter you have to order a copy of the ‘Hurts 2B Human’ album by P!nk on JB Hi-Fi in store or online and keep your receipt, then visit the competition web page and complete the online entry form with all the required information including your contact details and your answer to the question “Why do you want to see P!nk live in New York City?” in 25 words or less. Competition closes at 11:59 pm AEST on Thursday, 2 May 2019. The JB Hi-Fi P!ink Competition commences at 9.00am AEDT on Thursday, 28 March 2019 and concludes at 11.59pm AEST on Thursday, 2 May 2019. The judging will take place on 3 May 2019. Winner will be notified by email.